Hello everyone! This deck has slowly turned into my pride and joy. 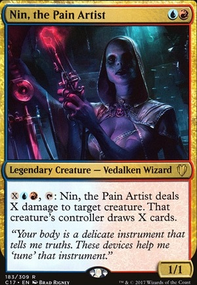 I have always been told that Nin, the Pain Artist was a terrible card so I decided to do the best I could with her. This is a combo or storm deck. I would love to finish the deck, this needs fetch lands, force of will and mana drain. I am in the process of making a primer to share this deck as much as possible. If you any suggestions please comment and let me know.